Perfect for those looking to improve performance, build muscle or increase strength through the combination of Whey Protein, Creatine Monohydrate, Glutamine, Taurine and Leucine. All-in-one+ is further enhanced with the exciting new carbohydrate source Palatinose, a sugar substitute designed to taste sweeter than sugar. Palatinose offers a fast acting, slow release energy source. For best results use 2 servings of All-in One+ daily to help support lean muscle and strength gains. Take 1 at breakfast, another immediately after exercise as a vital post-training meal or between meals where required. Add 2 scoops (40g) to 300ml of cold water in an EQ Nutrition shaker, shake and consume. Protein Blend (Whey Protein Concentrate (Milk), Whey Protein Isolate (Milk), Milk Protein Concentrate, Hydrolysed Whey Protein Concentrate (Milk), (Emulsifier: Soy Lecithin )) Creatine Monohydrate, L-glutamine, Cacao Powder, Wheat Protein, Isomaltulose*, Flavour, Maltodextrin, Creamer (Refined Fractionated, Palm Oil, Lactose, Milk Protein), Taurine, Thickener (Xanthan Gum), BCAA (2:1:1) (L-leucine, L-Isoleucine, L-Valine, Emusifier: Sunflower Lecithin), Sweeteners (Acesulfame K, Sucralose, Natural Stevia), Sodium Chloride, L-leucine, Egg Albumen. *isomaltulose (Palatinose) is a source of glucose and fructose. 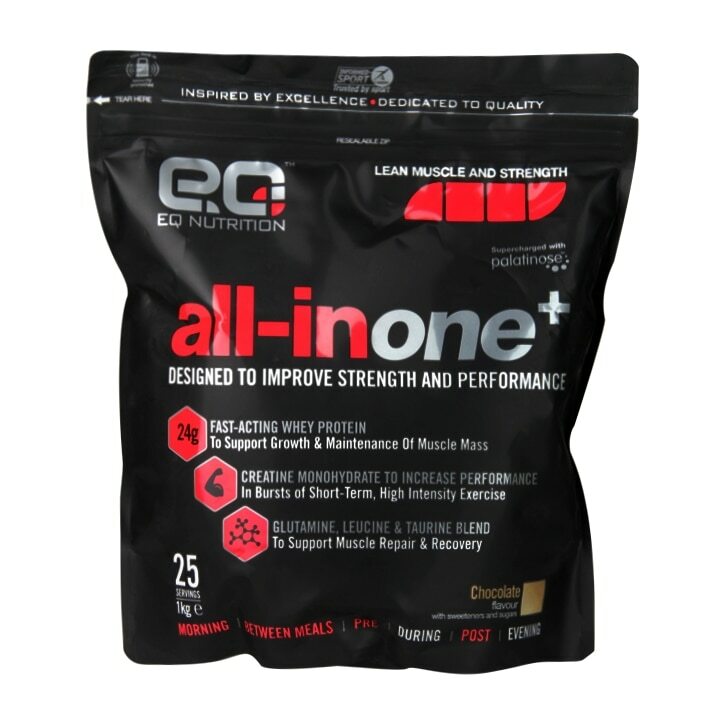 EQ Nutrition All In One+ Chocolate is rated 5.0 out of 5 by 2. Rated 5 out of 5 by Src1 from As an All in One this is a winner The whole formulation is effective. I 've been using this for a few months and my training is progressing. I had been using other brands All in Ones and never really noticed any benefit or believed that they did anything but since switching to this I am moving forward and enjoying the challenge again.